Providing service to customers becomes so much easier when you have records of their details in Loc8. Using the records, you can instantly view their primary information such as site addresses, assets located at those sites, the list of employees of the company customer with whom you will communicate on a regular basis (primary and billing contact) etc. With time, you can use the data from the customer profile to observe the trend of works done for them, and advice preventative maintenance plans they would need. In this article, we will see how to create profile for a company customer, who engages with you through one or more of their employees available at their sites. To know more about company customers, please read the article Introduction to customers. 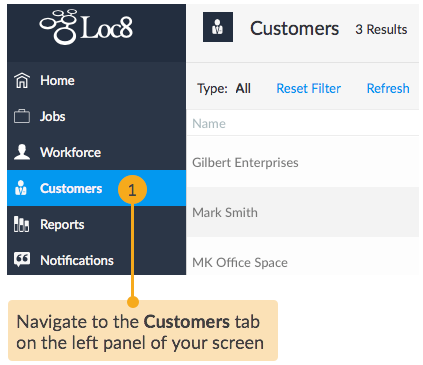 STEP 1 If this is the first time you are adding a customer to Loc8, you can use the Getting Started section as your guide to add your first customer. 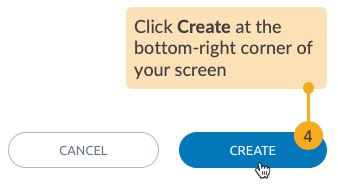 To do that, just click ADD YOUR FIRST CUSTOMER block and select Company. For subsequent customer creations, go to the Customers page. STEP 2 Open the Customer Creation wizard. 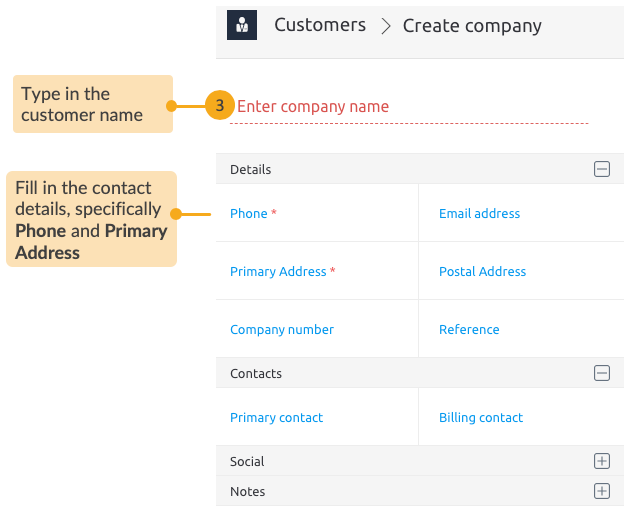 STEP 3 Fill in the Company customer's profile. Start by entering the mandatory details such as Phone and Primary Address. You may also enter the primary customer contact at this point. You can jump straight to the last step from here and complete customer creation. Alternatively, you may add a few more details such as the primary or billing contact and customer site details before you finish. 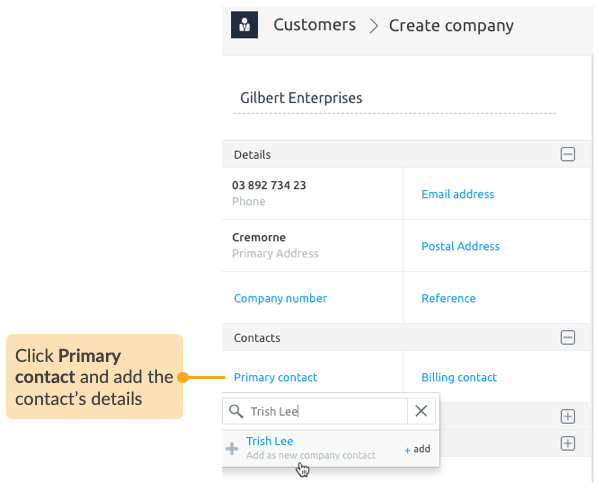 Under Contacts, you can add the customer's Primary contact. Expand the profile and go to the Sites tab. State the locations owned by the customer. This is most likely where your team will visit for completing jobs. If the customer has more than one site, add all of them here. 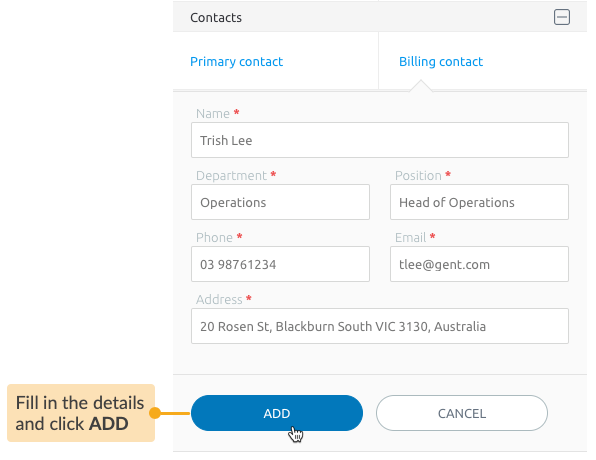 Once you have added the sites and created the customer, you can go back and add site contacts for each of the sites, where you would add the contacts in the Contacts tab. STEP 4 Lastly, go ahead and create the customer. Now that you've set up customer profile, you can easily access their details from Customers area, review or make changes as required, and quickly create jobs for them. You can read about this in the article View and Manage your Customers.